Link Building is one of the key factors for getting your blog post ranks in the Google and other search engines. 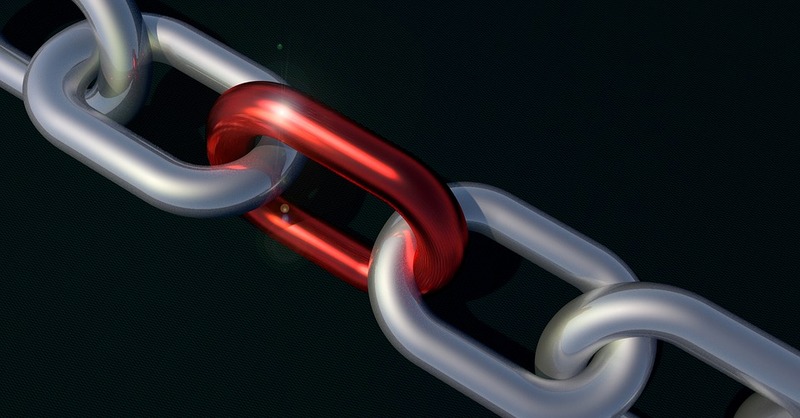 High-Quality backlinks not only boost your domain scores but also increase the search engine ranking of your articles. Wait… this is not the biggest challenge yet. The question of approach arises when you know to whom to approach? But, What if you don’t know this? For a beginner, it is very difficult to find backlink opportunities for their blog or site. Since they don’t find any opportunity, the next following questions do not arise. Now, a question may arise? How to find these backlink opportunities. 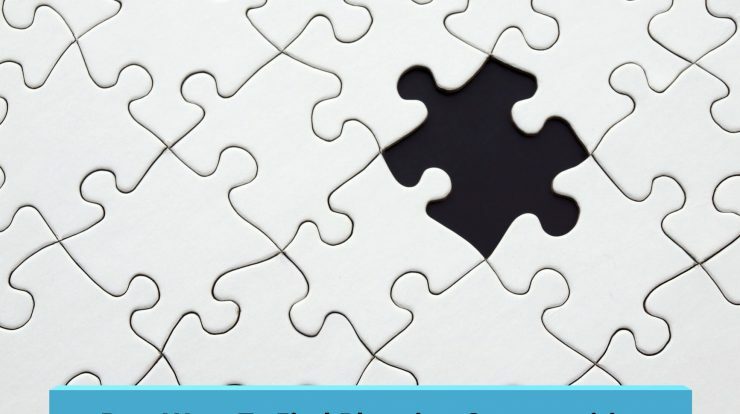 What all are the tactics to find whom to approach for building backlinks? Hereby, in this article, we will tell you, how do we find the backlink opportunities for our blog. 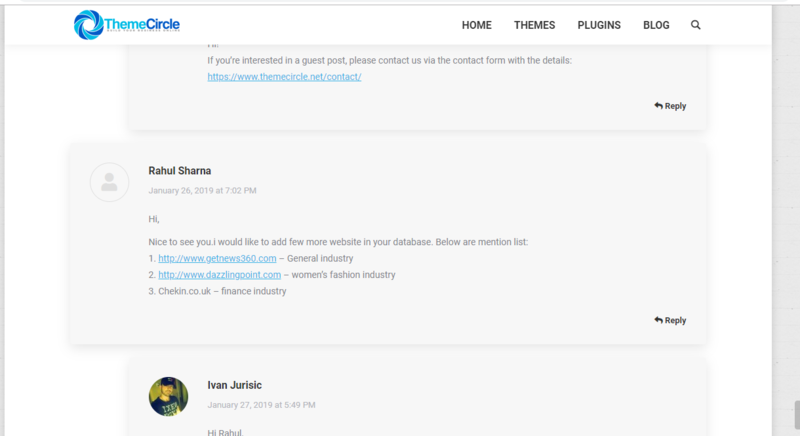 How to find blog commenting site? How to get a backlink from Wikipedia Page? How to find guest blogging opportunities? etc. This article is written especially for a beginner, who don’t have any idea about building backlink and looking for the first step to start with it. This article will ease your process of building backlinks. This article will tell, What will be the first step when you start building backlinks for your site? Assuming you own a blog and looking for creating good backlinks for your site. Hereby, the below tactics will help you in building it. Yes, Google search can help you in finding backlinks opportunities for your blog or site. All you need to is use double inverted comma (as shown in below image) while searching on Google. 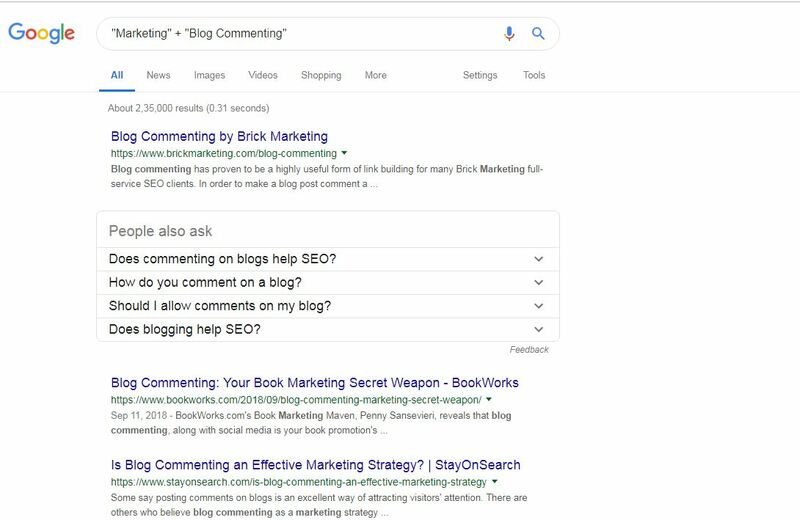 The above search term will ask Google to find the list of websites which contains keywords ‘Marketing’ and ‘Blog Commenting’ in it. Next, for more such combinations, you can also use the online tool called ‘Drop My Link’ from the below link. Using this tool, you can easily find the millions of blog commenting opportunities online. This is another best way to find backlinks opportunities. In this technique, all you need to do is just spy on your competitor’s backlinks portfolio and using the same reference, try to build backlinks for your site. You can use any of these free backlinks checker tools, to spy on your competitors. 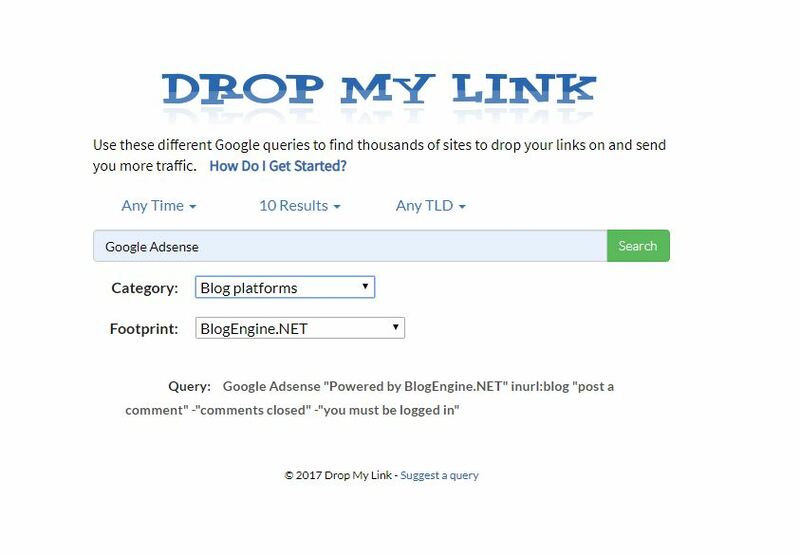 Next, once you get the list of backlinks, approach them requesting backlink for your blog or site. For example, just check out the backlinks portfolio of ShoutMeLoud blog below. You will find a backlink from a website called ‘Feedburner‘. Using the same reference, we also successfully build a backlink from the same website. For proof, you can check out the below snapshot of our backlinks. To sum up, spying on your competitor is the best way to get backlinks opportunities for your blog or site. Guest Posting is a great SEO tool for building backlinks. If used correctly then you can build good number of backlinks using Guest Posting technique. To use this technique, all you need to do is just find some good blogs and approach them asking for the backlinks. But, a question may arise. 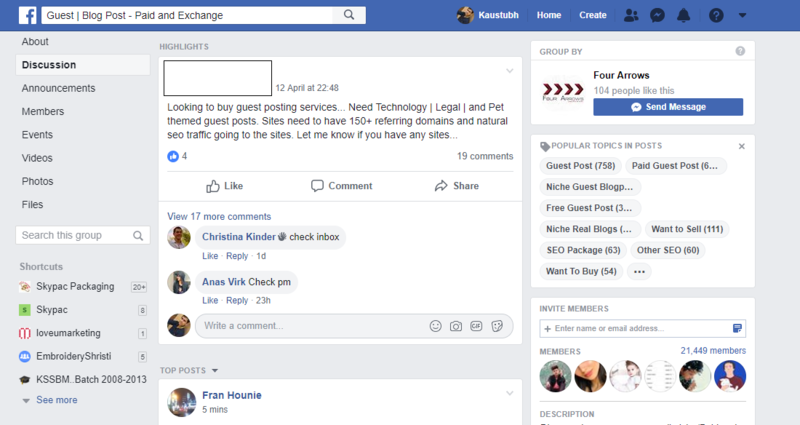 How to find good guest posting opportunities? How to find the blog that are accepting guest posting article. To get the answer, please read below. There are three easy ways to find blogs accepting guest posting. Join Social Media Groups to find both free and paid guest posting opportunities. Take the help of online consultants to find such websites. For Example, ‘Guest Post Tracker‘. This website will provide you the list of websites or blogs accepting guest post at cheapest rate. Take the help of Guest Posting Articles available online. This article is a good source of information for finding the list of website accepting guest posts. For example, just check out the below article written on Guest Posting. At the end of this article, you will find lots of bloggers commenting and sharing their blog url with others. Yes, this is also a good option to find the backlink opportunities. In this case, all you need to do is request link exchange with others. 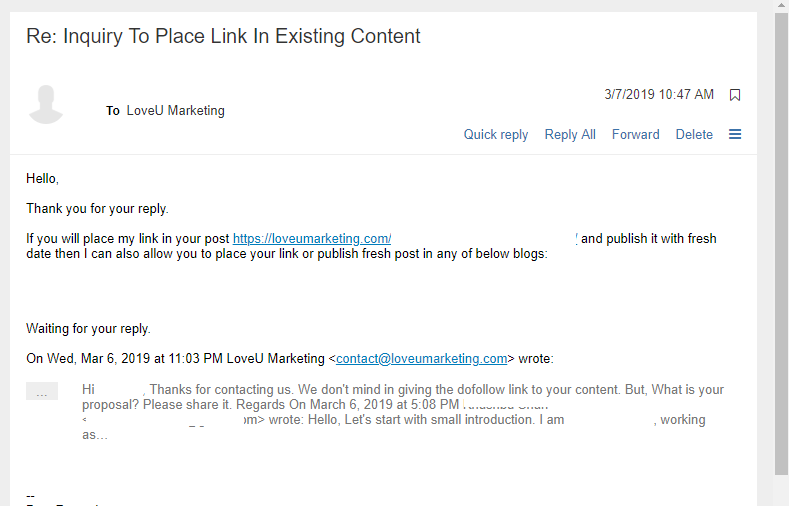 In the below example, someone has requested us for the guest posting. In return we asked for the link exchange and she immediately got ready for it. That’s all. Use the above mentioned techniques to find good backlink opportunities. Trust us, after using the above techniques, you will have the on hand list of website accepting guest posting. While building the backlinks, one of the biggest challenge you will face is finding website or blog for creating it. But, remember, finding such websites is not an easy job. Infact, this first step is the biggest problem in building the backlinks. Hence, we have written the above article to help you. The above article will help you to approach and find backlinks opportunities. Trust me, the above techniques will give you millions of opportunities to you. At last, if you face any problem in finding the opportunities then feel free to ask your queries in below comment box. We will be happy to help you.